entolla.com - COV3R - A game variant. Introduced by our friend enigma, cov3r is a small change to the rules which makes a big change to the game. In addition to your first move covering the corresponding corner square, it must also cover the two adjacent squares, the three of them being in a V3 configuration. Hence the name coV3r! (See Fig 1, left). A possible coV3r start is shown here (Fig 2). 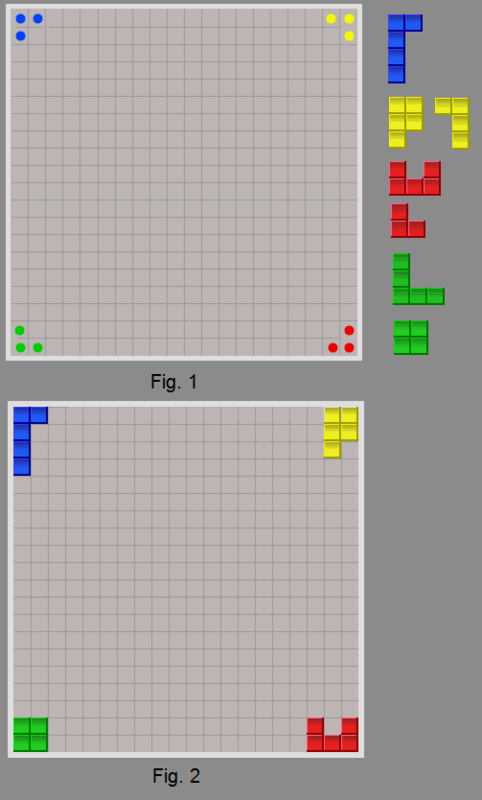 The result is more open game, balanced between blue/red and yellow/green, because the 4th blue cannot connect with the 3rd red, disabling the so-called "power openings", or "wall games". Give it a try and see if it doesn't lead you to more variety, and a real change of pace for the game.